Download "UNION UNIVERSITY MASTER SOCIAL WORK PROGRAM ASSESSMENT OF STUDENT LEARNING OUTCOMES LAST COMPLETED ON SPRING 2014 Form AS4 (M)"
1 UNION UNIVERSITY MASTER SOCIAL WORK PROGRAM ASSESSMENT OF STUDENT LEARNING OUTCOMES LAST COMPLETED ON SPRING 2014 Form AS4 (M) Accreditation Standard The program provides summary data and outcomes for the assessment of each of its competencies, identifying the percentage of students achieving the. Accreditation Standard The program uses Form AS4 (B) and/or ASR (M) to report assessment outcomes to its constituents and the public on its website and routinely up-dates (minimally every two years) these postings. 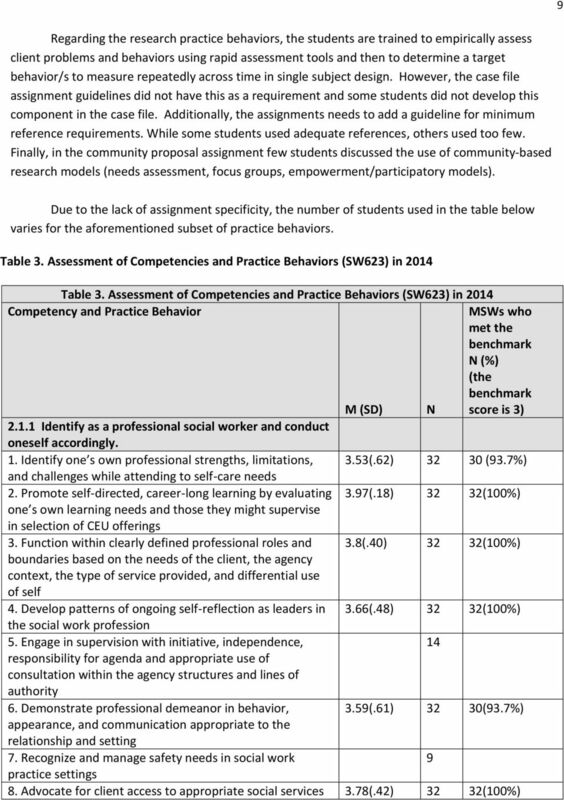 All Council on Social Work Education programs measure and report student learning outcomes. 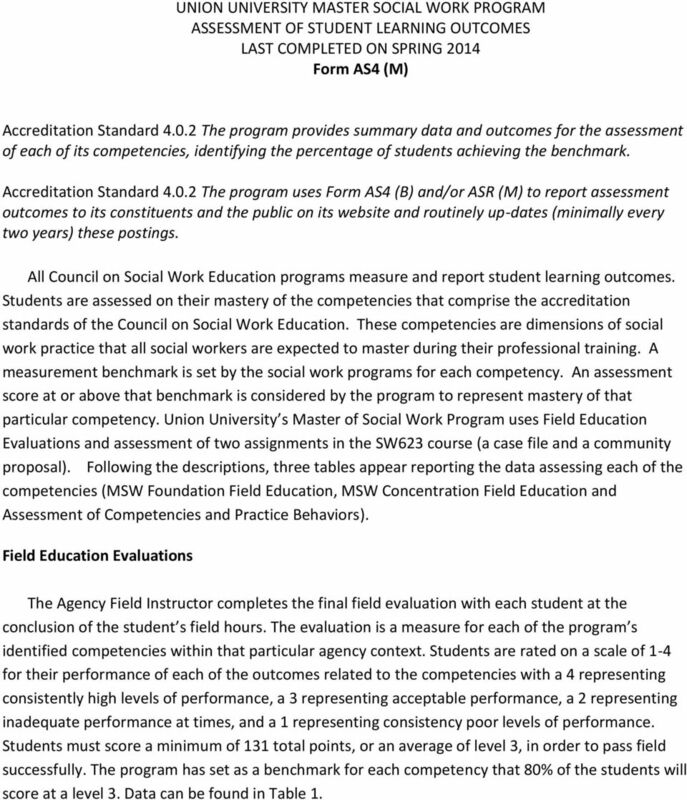 Students are assessed on their mastery of the competencies that comprise the accreditation standards of the Council on Social Work Education. 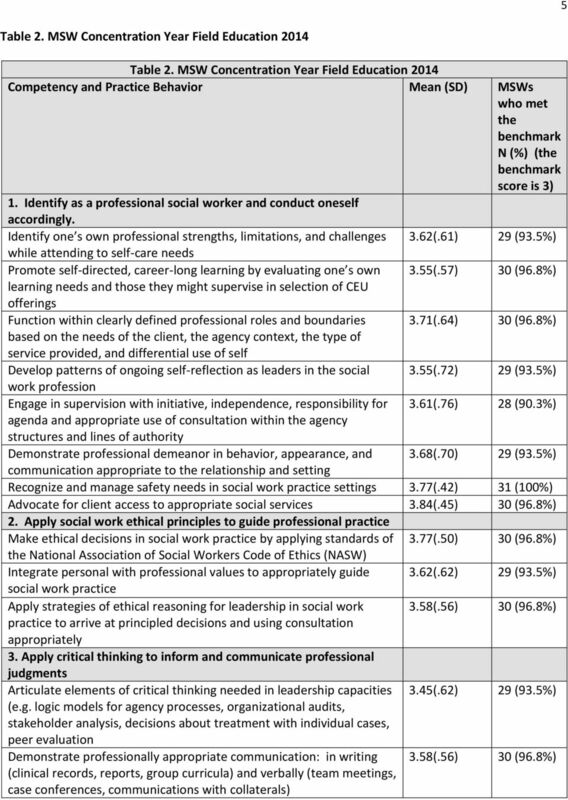 These competencies are dimensions of social work practice that all social workers are expected to master during their professional training. 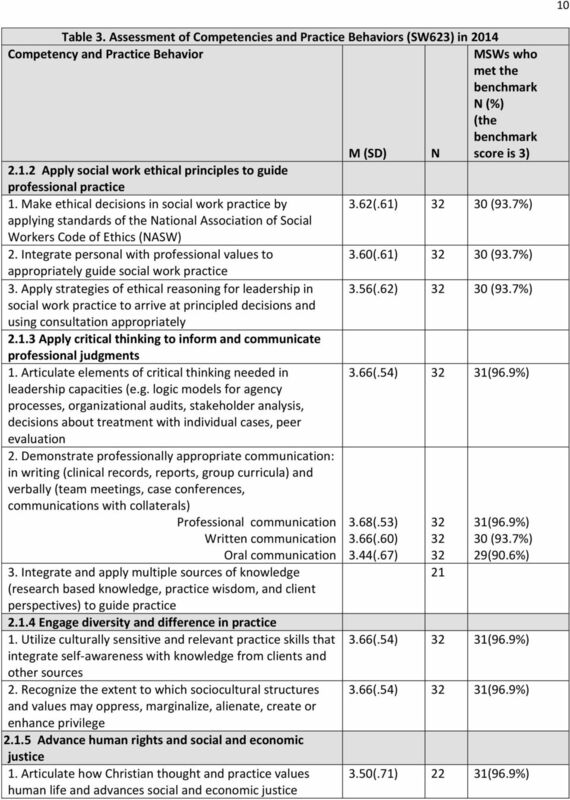 A measurement is set by the social work programs for each competency. An assessment score at or above that is considered by the program to represent mastery of that particular competency. 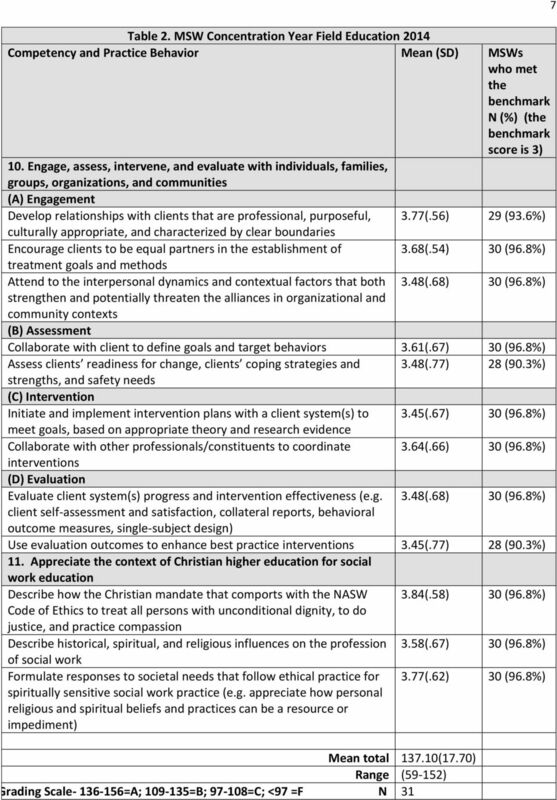 Union University s Master of Social Work Program uses Field Education Evaluations and assessment of two assignments in the SW623 course (a case file and a community proposal). 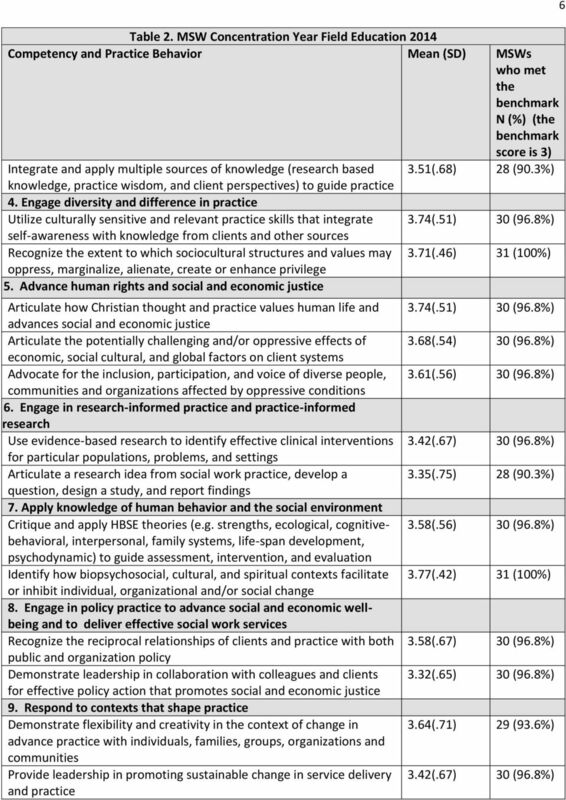 Following the descriptions, three tables appear reporting the data assessing each of the competencies (MSW Foundation Field Education, MSW Concentration Field Education and Assessment of Competencies and Practice Behaviors). Field Education Evaluations The Agency Field Instructor completes the final field evaluation with each student at the conclusion of the student s field hours. 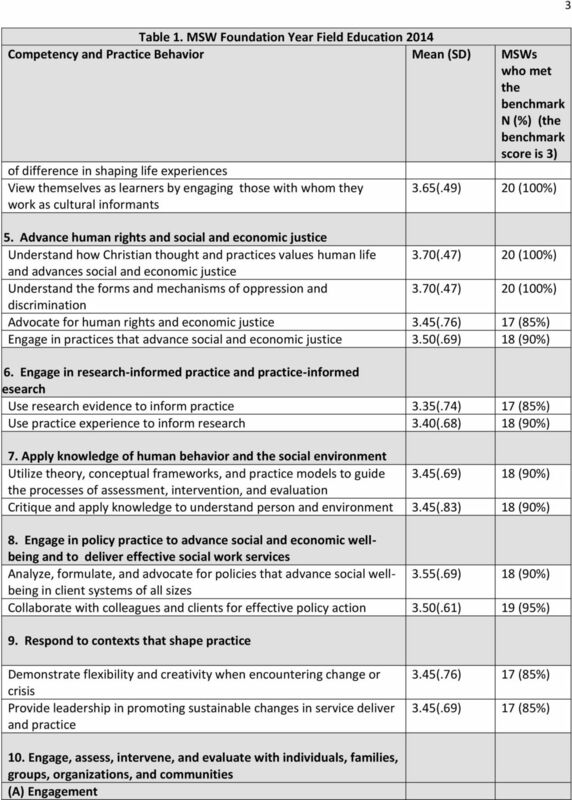 The evaluation is a measure for each of the program s identified competencies within that particular agency context. Students are rated on a scale of 1-4 for their performance of each of the outcomes related to the competencies with a 4 representing consistently high levels of performance, a 3 representing acceptable performance, a 2 representing inadequate performance at times, and a 1 representing consistency poor levels of performance. Students must score a minimum of 131 total points, or an average of level 3, in order to pass field successfully. The program has set as a for each competency that 80% of the students will score at a level 3. Data can be found in Table 1. 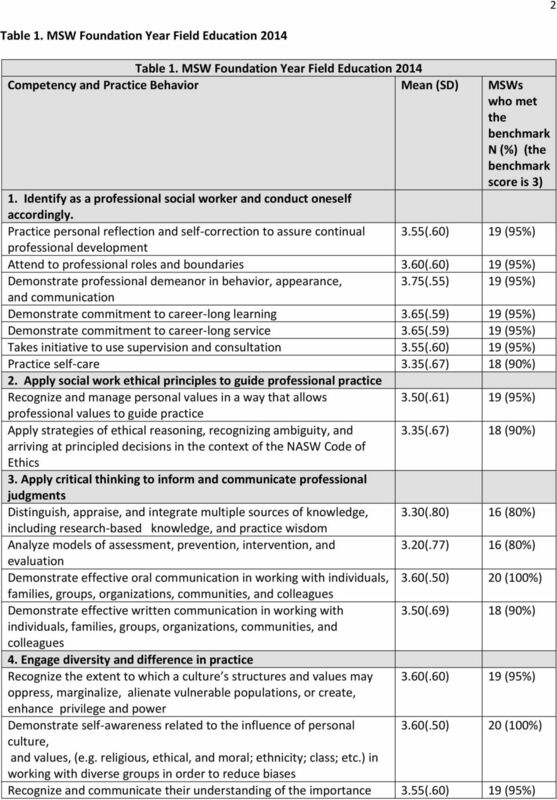 8 8 Assessment Scale for Evaluation of Practice Behaviors (SW623) in 2014 The purpose of this assessment is to have faculty complete a systematic evaluation of advance practice students at the end of the curriculum sequence to assess concentration year practice behaviors. 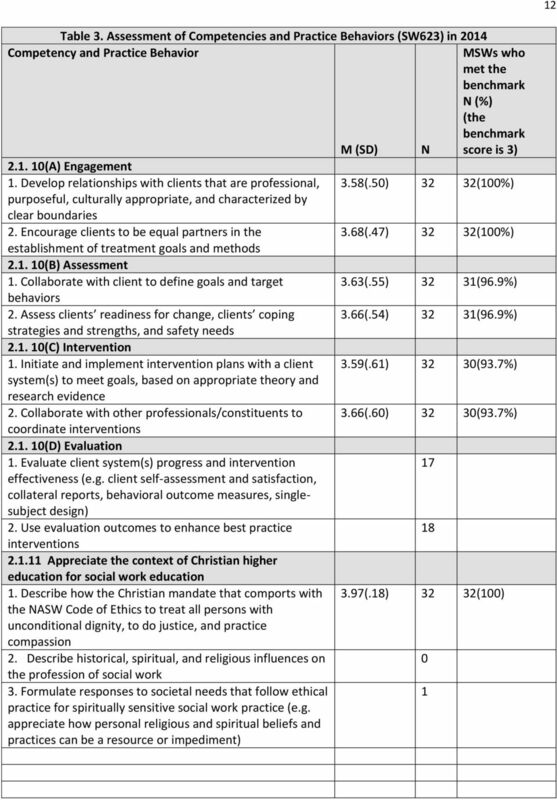 Faculty developed a rubric to rate the two assignments from SW623 (case file and community proposal) for all the concentration year practice behaviors. The assessment was completed for the first time in spring As a result of this assessment, we concluded the SW623 assignments guidelines need reworking to adequately measure the following practice behaviors consistently across all students. 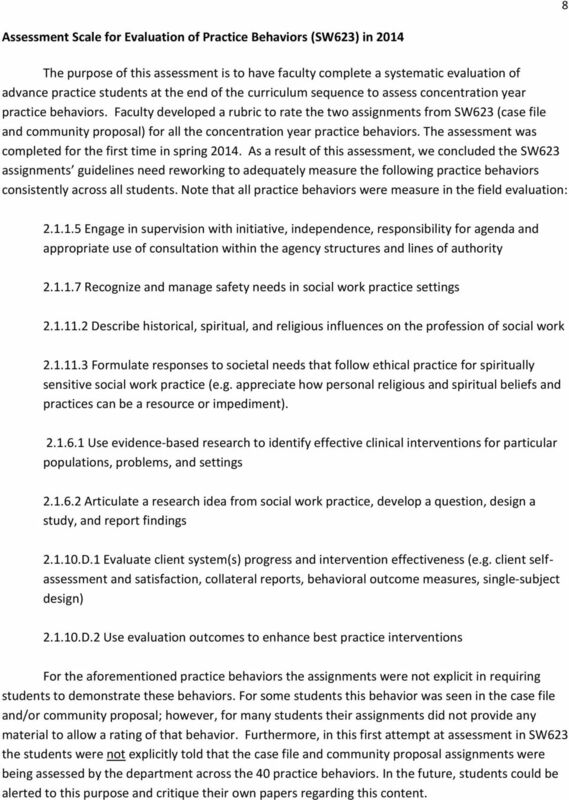 Note that all practice behaviors were measure in the field evaluation: Engage in supervision with initiative, independence, responsibility for agenda and appropriate use of consultation within the agency structures and lines of authority Recognize and manage safety needs in social work practice settings Describe historical, spiritual, and religious influences on the profession of social work Formulate responses to societal needs that follow ethical practice for spiritually sensitive social work practice (e.g. 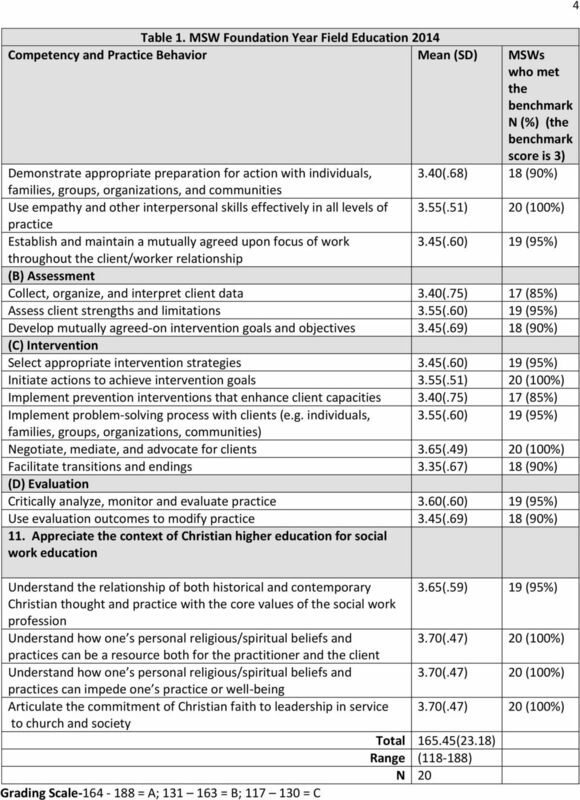 appreciate how personal religious and spiritual beliefs and practices can be a resource or impediment) Use evidence-based research to identify effective clinical interventions for particular populations, problems, and settings Articulate a research idea from social work practice, develop a question, design a study, and report findings D.1 Evaluate client system(s) progress and intervention effectiveness (e.g. client selfassessment and satisfaction, collateral reports, behavioral outcome measures, single-subject design) D.2 Use evaluation outcomes to enhance best practice interventions For the aforementioned practice behaviors the assignments were not explicit in requiring students to demonstrate these behaviors. For some students this behavior was seen in the case file and/or community proposal; however, for many students their assignments did not provide any material to allow a rating of that behavior. 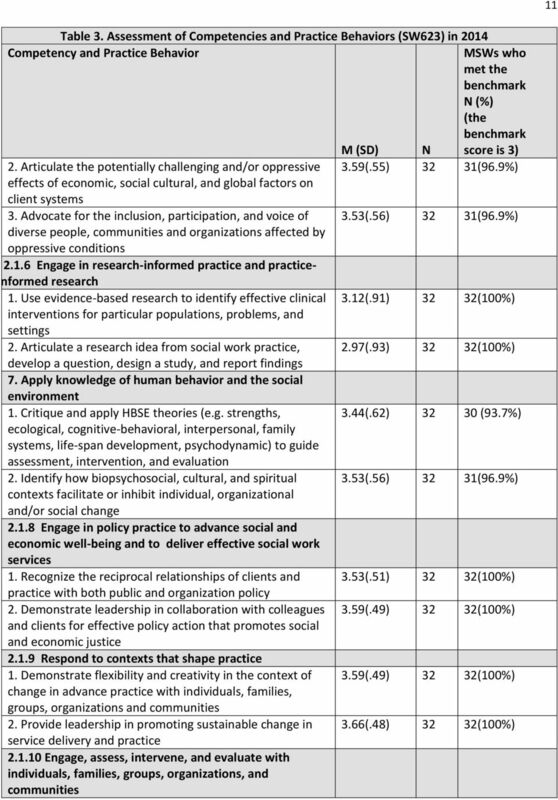 Furthermore, in this first attempt at assessment in SW623 the students were not explicitly told that the case file and community proposal assignments were being assessed by the department across the 40 practice behaviors. In the future, students could be alerted to this purpose and critique their own papers regarding this content.